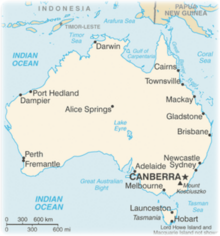 Additional Info: Australia is slightly smaller than the US contiguous 48 states. The British calimed the land in 1770 and initially settled it as penal transportation as part of the colony of New South Wales on 26 January 1788. The Great Barrier Reef is the world's largest coral reef system, composed of roughly 3,000 individual reefs and 900 islands stretching 616 miles over an area of approximately 132,974 sq. miles. 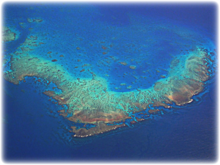 The reef is located in the Coral Sea, off the coast of Queensland in northeast Australia. Thirty species of whales, dolphins, and porpoises have been recorded in the Great Barrier Reef, including the dwarf minke whale, Indo-Pacific humpback dolphin, and the humpback whale. Large populations of dugongs live there. 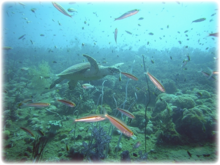 Due to its vast biodiversity, warm clear waters and its accessibility from the floating guest facilities called 'live aboards', the reef is a very popular destination for tourists, especially scuba divers. Many cities along the Queensland coast offer daily boat trips to the reef. Several continental and coral cay islands have been turned into resorts, including the pristine resort Island of Lady Elliot Island. To get away from the popular shore diving sites and really see a large part of the Great Barrier Reef, many recommend going on a live aboard cruise, where you can travel a fair distance from the mainland. The reef acts as a barrier to the sea so ocean swells are quite calm. Cairns is a regional city and Local Government Area located in Queensland. Cairns is a popular travel destination for foreign tourists because of its tropical climate and proximity to many attractions. 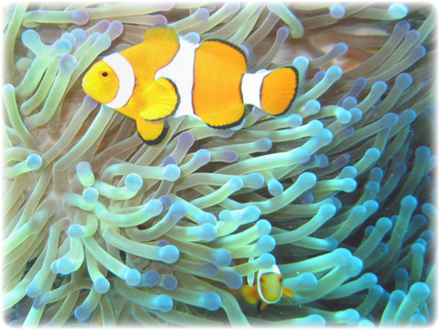 The Great Barrier Reef can be reached in less than an hour by boat. 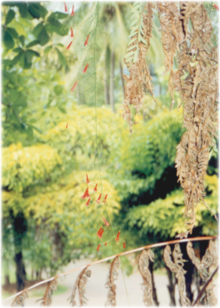 The Daintree National Park and Cape Tribulation, about 80 miles north of Cairns, are popular areas for experiencing a tropical rainforest. Cairns is a great spot to try the multitude of fishing opportunities in Australia - from fly fishing to sport fishing and game fishing. 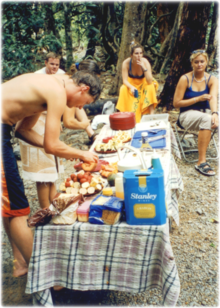 Fly fishing - Cairns, and the rainforest areas surrounding it, provides a lot of variety for the fly fisherman (or person wishing to learn). Many companies offer full day, overnight or fully guided extended charters. Possible locations include the local rivers and estuaries, the rocky headlands, from beaches, offshore, and from the reef. Scenic freshwater streams of the rainforest, are home to shy Jungle Perch, Sooty Grunter, Small Tarpon, and Juvenile Barramundi. Sport fishing - Almost every species of game fish available in the Pacific can be caught from the Cairns area - including Yellowfin tuna, Cobia, dolphinfish (mahi mahi), barracuda and sailfish. The Cairns section of the Great Barrier Reef is internationally famous for its Black Marlin fishery. Game fishing, often called offshore or big game fishing, is targeting large bony fish such as tuna and marlin in the open sea. North Queensland has long been recognized as the Black Marlin capital of the world with the area stretching from off Cairns north to Lizard Island. The preferred technique for catching the giant Black Marlin is to troll large whole fish baits such as Scad, Queenfish, Rainbow Runner, Tuna and Mackerel. These baits are rigged to either skip across the surface or swim within the surface layers. Bushwalking, the Australian term for hiking, is often recommended in southwest Western Australia. One popular walk is located in Leeuwin-Naturaliste National Park, named the Cape to Cape Track. It is named after the two locations at either end of the park which have lighthouses, Cape Leeuwin and Cape Naturaliste. It is located in the Augusta-Margaret River and Busselton council areas, and is claimed to have the highest visiting numbers of any national park in Western Australia. In 2001, the Cape to Cape Track was opened, an 83-mile walking trail along the Leeuwin-Naturaliste ridge. This hike features spectacular coastal and forest scenery, a fascinating geology and history, and wonderful wildflowers in spring. The entire track can be a 5-7 day challenge although the trail can be joined at various access points for day hikers. There is no public transport right to the Track. There are daily coach services operate between the nearby towns of Busselton, Dunsborough, Margaret River and Augusta. There are four wild campsites - at Mt. Duckworth north of Yallingup, Moses Rock, Ellensbrook and Deepdene. The Track is divided into 5 sections. Brochures for each section, published by CALM, are available at CALM offices, outdoor equipment shops and local Visitor Centers (Au$2 each or Au$8 per set of 5). If you are staying in the Cairns, look for the locals' secret, Crystal Cascades Cairns - this is a secluded freshwater swimming hole hidden in a tropical rainforest. This is a great day hike with a good lunching spot. No public transport takes you there but you can get a taxi or use a rental car. Take the drive up Reservoir Rd towards Redlynch, take the Redlynch Connection Rd turnoff and simply follow the signs to "Crystal Cascades". Closer to Brisbane, is the Dorrigo National Park - it has several tracks allowing hikers to view the park's waterfalls and vistas to the coastal plain. A notable feature of the park is the Skywalk, an elevated walkway through and above the treetops, providing birdwatchers with an excellent view of local bird life. Nearer to Sydney, check out the bushwalking in the Blue Mountains, which can be enjoyed in almost any weather, and is a wonderful way to experience the sights, smells, and sounds of the bush. If looking for some beautiful biking lands with great beaches and mountains, try attempting a ride around Tasmania. Tasmania is an Australian island and state and is located 125 miles south of the eastern side of the continent, being separated from it by Bass Strait. The state of Tasmania includes the island of Tasmania, and other surrounding islands. Alternatively, you can cycle along the Great Ocean Road from Adelaide to Melbourne (715 miles). This ride will take you through forests, fern gullies, vineyards and along the spectacular coastline of the Fleurieu Peninsula and Encounter Bay. 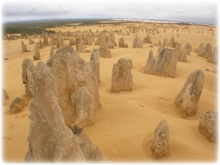 Nambung, a national park in Western Australia, 100 miles northwest of Perth, contains the Pinnacles Desert. The Pinnacles are limestone formations. The raw material for the limestone of the Pinnacles came from seashells in an earlier epoch rich in marine life. These shells were broken down into lime rich sands which were carried inland to form high mobile dunes. The best season to see the Pinnacles is spring from August to October, as the days are mild and wildflowers start to bloom. The pinnacle formations are best viewed in the early morning or late afternoon as the play of light brings out the colors and the extended shadows of the formations delivers a contrast that brings out their features. 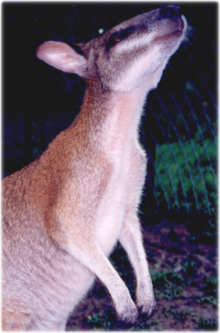 Most animals in the park are nocturnal, but emus and kangaroos can also be seen during the daytime, more commonly in the evening or early morning. 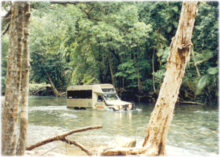 As of February 2007, entrance to the park costs AUS$10.00 per car, or AUS$4.00 per person on a tour bus. Kalbarri is a coastal town located 366 miles north of Perth, Western Australia. 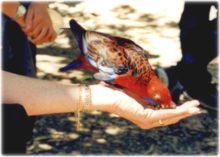 The town is geared towards tourism, with attractions including the daily pelican feeding, the Kalbarri National Park, Murchison Gorge and the Murchison River. Also there are two charter boats to go on to view the Murchison River. The gorge is within the Kalbarri National Park, and is in near pristine condition. Uluru, also known as Ayers Rock, is a large sandstone rock formation in the southern part of the Northern Territory, central Australia. It lies 208 miles south west of the nearest large town, Alice Springs. Kata Tjuta and Ulutu are the two major features of the Uluru - Kata Tjuta National Park. Uluru is sacred to the Pitjantjatjara and Yankunytjatjara, the Aboriginal people of the area. It has many springs, waterholes, rock caves and ancient paintings. 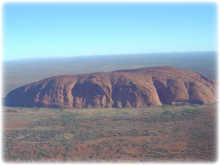 Uluru is listed as a World Heritage Site for its natural and man-made attributes. Ningaloo Reef is a fringing coral reef located off the west coast of Australia, approximately 745 miles north of Perth. The reef is 175 miles long. 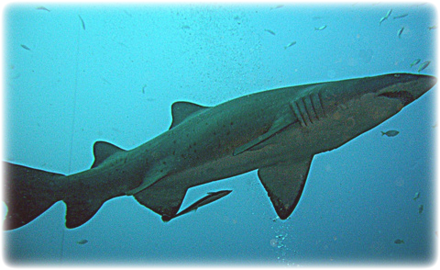 It is known for its seasonal feeding concentrations of the whale shark, and the conservation debate surrounding its potential tourism development.